Nike's new app features allow you to scan and shop with a click of a button. 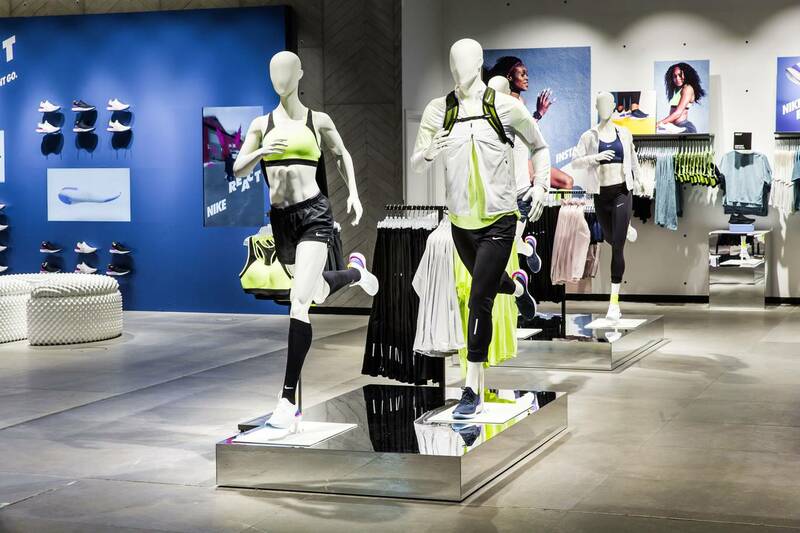 When you walk into the Nike Town London store, you’d be forgiven for thinking you’d stepped into a high-end gym. A DJ welcomes you in, spinning pulsing house music, whilst attractive staff clad head-to-toe in workout gear (Nike calls their in-store staff athletes) swan around the store, with seemingly no tills in sight. Shopping in a Nike store is big on the “experience” side of things, complete with cool installations and an enviable collection of trainers making up the sneaker wall. This all part of Nike’s plans to get consumers to continue to shop in store, with the help of technology. 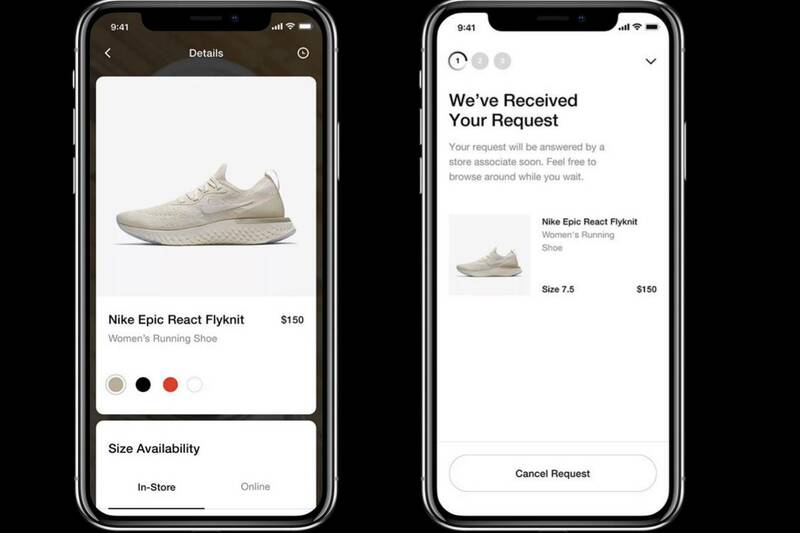 The company recently released the new Nike App in the Oxford Street store, which aims to bridge the gap between shopping online and shopping in-store in a seamless way. Using geolocation tagging, the app knows when you arrive in the store and offers up a range of new features to make physically browsing products a more enjoyable experience, via your smartphone. “We're all heads down 24/7 and we have to be pretty impactful to get consumers attention and we need to figure out how we bring that behaviour into how consumers are shopping in stores,” Nike’s global senior director of member and athlete services, Michelle Warvel, tells the Standard. Nike says it spoke to over 500 consumers around the world to talk about what they liked and disliked about shopping in store to craft these features around what they wanted. The feedback included wanting an easy way to find products, being able to self-serve without speaking to a store associate and also that it should be a personal experience. “We took that feedback to really define what the Nike App would be,” says Warvel. For Nike, the shopping journey now starts at home. If you’re looking online for a particular item, say some trainers or leggings, you can check to see if that item is in stock in your size. Using the app, you can reserve the item and in less than two hours, it will be ready to pick up. This feature is for anyone that has ever traipsed across London to find a specific piece of clothing in their size, only to be disappointed. The reserve features work in store too, via try on. Scan a barcode in a pair of trainers, and request to try on your size. The app walks you through the different steps, from a Nike athlete picking up the order, to when the boxfresh pair is available to pick and try on, all in a matter of minutes. You can even request for items to be placed in specific areas of the store, whilst you’re browsing. "Consumers are moving so fast, they're digitally empowered and enabled and we have to keep up with the pace "
Once you’ve tried something on and like it, you can pay on the spot with the instant checkout feature, allowing you to skip the queues and shop in a way that works for you. Putting scanners in the hands of shoppers via their smartphones turns a passive browsing moment into something fun and engaging, and crucially, will get people coming into store again and again. One of the first criteria for the new features was that they shouldn’t form a separate app, they needed to be part of the existing Nike app infrastructure. “That was a big principle and a lot of that was because as we start to find new ways of shopping, of merging digital and physical, [we needed to] make sure that all of our digital experiences and physical experiences are really tied closely together,” she explains. Teams across Nike were brought together to ensure that this integration could be possible, allowing Nike customers to shop across platforms interchangeably. “So it wasn't about creating new tech or introducing a lot of new capabilities, it was really about how do we bring the features together and the teams together within Nike to start thinking and working a little differently,” adds Warvel. The new Nike App features first rolled out to Nike stores in the US, before landing in London. The company hopes to have these features available in all of its UK stores in the coming months. There could be some new and improved parts of the app by that point too. One trial currently in the US allows shoppers to scan an item and request to have it sent directly to a fitting room, like the app equivalent of having a Nike personal shopper on hand to assist you. Warvel says this should be coming to London soon. Another feature undergoing trial is to do with the mannequins. Currently only available in the New York Nike store, shoppers can scan a mannequin and request any of the clothes and products to be sent to a fitting room. “We're constantly getting feedback which is why we do these pilots and expand them slowly and start to use these stores to reiterate and react to the feedback. [There’s] so many more services that we weren't necessarily thinking about in the beginning,” says Warvel. Yet, it’s things like this that will get customers to come back into stores. Research released at the end of last year said one in four shoppers could abandon the high street by the end of 2021. With HMV currently in administration and looking for buyers, brands need to do all they can to get footfall. Whether it’s embracingcheckout free stores like Amazon, or merging digital and physical shopping, tech is certainly one way to save the high street. Nike says its about being where the customers are. “Consumers are moving so fast, they're digitally empowered and enabled and we have to keep up with the pace,” says Warvel. “We've been really focused on obsessing over how we can make these services better, how we do we think of new ways to bring digital to life in our stores and really editing or pivoting if it's not working. You can't be afraid to do that,” she adds. For more insight into fashion retail trends and experiences download our Fashion Futures 2018 and Retail Futures 2018 : Storefront Salvation reports.